BBFC Consumer Advice:Strong threat, violence. Please note this film contains a sequence of flashing lights which might affect customers who are susceptible to photosensitive epilepsy. ‘Escape Room’ follows six strangers who find themselves stranded in a situation beyond their control or understanding, and must work together to have any hope of survival. Trapped in a terrible place, with no idea what to do or how to get out, things look hopeless for them at first. Their only possibility of escape is to use their wits and learn to work as a team. 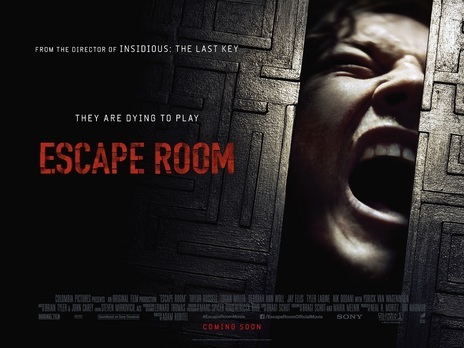 ‘Escape Room’ is a gripping psychological horror from the director of ‘Insidious: The Last Key’, starring Logan Miller, Deborah Ann Woll and Taylor Russell. Please note this film contains a sequence of flashing lights which might affect customers who are susceptible to photosensitive epilepsy.